Liverpool's Mohamed Salah scores their first goal. 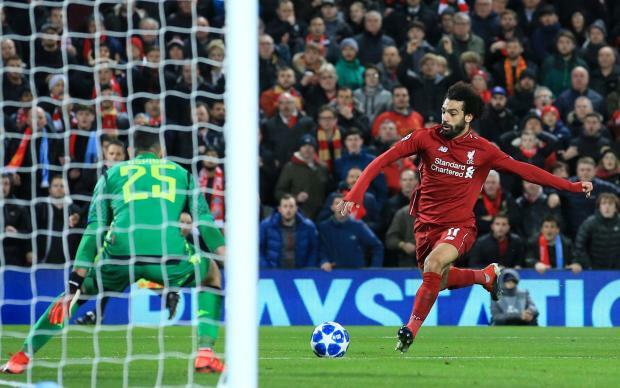 Mohamed Salah's first-half strike gave Liverpool the 1-0 win over Napoli they needed at Anfield to qualify for the Champions League's last 16 on Tuesday, sending the Italian side crashing out. Liverpool knew that a 1-0 win, or a victory by two goals or more, would be enough to seal a top two spot in Group C, and Salah was again the hero for the hosts, scoring what proved to be the winner in the 34th minute. Napoli pressed for a leveller in the second half, with Liverpool goalkeeper Alisson denying Arkadiusz Milik in stoppage time, but the home side's resolute defence -- which has conceded just six Premier League goals all season so far -- stood firm. Paris St Germain's victory at Red Star Belgrade meant they finished top while Napoli, who started the day leading the way, exited the competition as Liverpool snatched second spot on goals scored.